We'd just moved to the United States from Germany after my dad was accepted to OCS at Ft. Sill, in Oklahoma. Instead of taking us with him, my dad bought us a cute little house with a swing set in the back yard in a small town in Kansas where my mom's oldest sister and her family could keep us company while my dad studied half-a-day's car ride away. I was enrolled into Kindergarten there, and as soon as my father graduated from OCS, he was ordered to Vietnam for a year. Suddenly my safe little world was turned up-side-down. My dad was missed every single day. And, while he was gone, everything was scary! Kansas was quite different from Germany... Grasshoppers, crickets and thunderstorms that shook the walls so that I feared they would collapse on top of us as my mother, brother and I huddled together in the basement, were just a few of the new things I quickly decided I could live my whole life without. And... I missed my beloved Oma as much as I knew my mom did. We never watched television in Germany, and I don't remember hearing music outside of Sunday-morning Mass before we moved to Kansas. However, after we moved to the States there was a blast of television and radio over-load! I quickly connected the tune my mother hummed as she drove the car or washed the dishes to her favorite story, (soap opera) Love is a Many Splendored Thing. And, television commercials practically wrote my Christmas list that year, which was headlined by the Easy Bake Oven and Mrs. Beasley doll! I was fascinated by The Price is Right and entertained by Mr. Green Jeans, Herman the Munster and Bert and Ernie. Oh! And, I couldn't sleep without a night-light until I was seventeen after a cousin let me and my little brother watch our first Dracula movie. Aside from all the prayers we said for his safe return, what I remember the most about the year my dad was in Vietnam was the music my mom played. I listened to her sing along to the most beautiful songs... Songs like, I'm Leaving on a Jet Plane, and 500 Miles, and (The answer my friend is) Blowin' in the Wind. My mom also taught me and my brother the words to, Puff the Magic Dragon. Other songs, like Bye-bye Miss. American Pie are memorable from that year too, but the music of Peter, Paul and Mary certainly stood out. subject of his personal politics aside... Mr. Yarrow delighted us with his music! word of the first verse of, Puff the Magic Dragon! I asked him to put it in writing! I remember Puff the Magic Dragon :)I had the album. oh those childhood memories are great! Loved Mrs Beasley and the easy bake oven too :) I did not have either of those but I had friends who did and they were kind enough to share! Oh fun! I love how music and smells and can transport us back to our childhood. I was also a big fan of Herman Munster and Price Is Right, as well as Donna Reed and Mr. Ed! What a wonderful post! Interesting insights into the life of a military family. 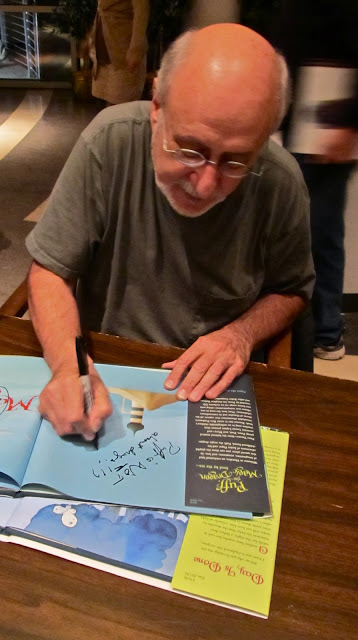 What a thrill it must have been to meet Peter Yarrow. I have Peter, Paul, and Mary on my iPod, along with many of the songs you mention. They are on a playlist and listening to the mix always takes me back in time to those days. So nice to see your comment this morning... Thank You! Last night was a trip down memory lane, for sure! However, as the daughter of a soldier ordered to Vietnam during a time when Mr. Yarrow admits to protesting; and, now as the mother of an Army Ranger scheduled to deploy to Afghanistan for a second time, it's impossible for me to agree with his opinions about how best to keep America safe and free. Just for the record, this Army mom VERY much wishes that preaching peace was all it took for America's enemies to embrace Her. 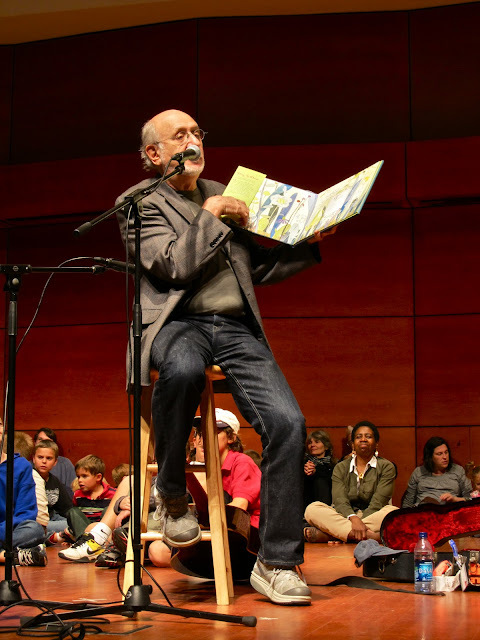 Oh how SWEET to here Peter Yarrow sing PUFF~The Magic Dragon. I would have cried sentimental tears all the way through it! You do the most interesting things Janet! I love how you live so true to YOU! You live with zest and PASSION! You are an inspiration to know! As the daughter of a military man, the wife of one and the mother of one, your wonderful post stirred up a lot of memories for me as well. Your son and all others currently and about to be deployed will be remembered in our daily prayers. It matters not what your political views are, the fact that men and women are putting their lives on the line for our countries at the very least, deserve not only our prayers but our unabashed support. Such a sweet post. I'd love to hear some stories from your life in Germany. It must have been fantastic. How cool to see that one of my favorite songs wasn't drug inspired. Such a relief!